The process of relocating my studio is not over yet, but we are getting there. This relocating business has been ongoing since early 2012. There was no denying: my situation was either being away from my work or being away from my husband. It goes without saying that over those past years this has got me thinking a lot about what away means. I took to dictionaries. There was a wealth of meanings and sayings. I remembered an old lady who used to live in my mother’s neighbourhood. She had a lovely little pet companion, a dachshund by the name of Wastel. And one day he was no more. She never said he had died, she’d always say he had gone away. Awayness comes in various kinds. Some awayness we choose, others we are forced into. Some awayness is temporary, others will be permanent. Some awayness feels like alleviation, others hurt. Some awayness we hardly notice, others will be life changing. Add to this, there was a constant flood of news about refugees. Migrants and refugees are facing awayness as fiercly as hardly any other group of people. Their homes might be bombed and non-existing in a matter of moments. Their loved ones might be killed. Their perspectives of getting an education or earning a living might vanish with the political regime changing. They might be left with just what they can carry or not more than the clothes they wear – everything else they used to live with is gone away in a moment of shelling. And there are people who see their homes flooded – this need not be the monsoon, it can be torrential rain in the Lake District. Or shaken to rubble by earthquakes, be it in Japan or Italy. Or burnt to embers by wild fires, be it in Australia or Spain. Or blown to pieces by tornados in the US. Or washed to the sea as in Norfolk. Cattle are taken away by drought in Africa. These are but some of the many shapes and diguises in which we might encounter awayness. The news tell us of the catastrophy, or the war, the bombing or the accident. The news do not tell that people lost all their family photos, their favorite soft toy, the violin their granddad used to play. It might be small things, but nevertheless they cannot be replaced or rebuilt. Once they are lost they are away for ever and a life is changed. When I had the idea to turn all this into an artist’s book, I knew this book would be different compared to all books I had made so far. I had to plan this book far away from my studio. I’d then pack my suitcase and travel to my studio for a working visit limited in time. Once there, I’d print all sheets and cut to size all material needed. I’d fold and press the cover sheets. There would be no board shear, no block cutter, and only the smallest of my bookbinding presses available to me after I had left heading home again. All machinery would be some 500 kilometres away. I packed a box with the hand tools I’d need: awl and needles, thread and bonefolder. Thus this book is special in more than one aspect. It is the last artist’s book I printed in the old place. But it is not made entirely there. I took the printed and folded sheets to finish them off away from the studio. I worked on a makeshift workplace in the tiny flat we were living in at the time. This book is not just about the meaning of the term away. It is made in different stages of being away, part of the book’s substance is awayness. It is built upon, has taken shape within awayness. It breathes awayness. The book itself is an edition of twelve one-offs. 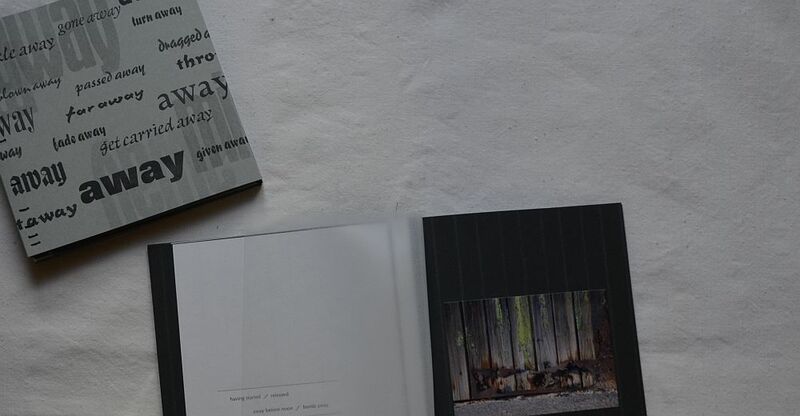 Each of the books comes with a unique compilation of twelve photographs depicting a scene of awayness. The text passages are taken from various dictionaries. All books are hand sewn as coptic bindings. 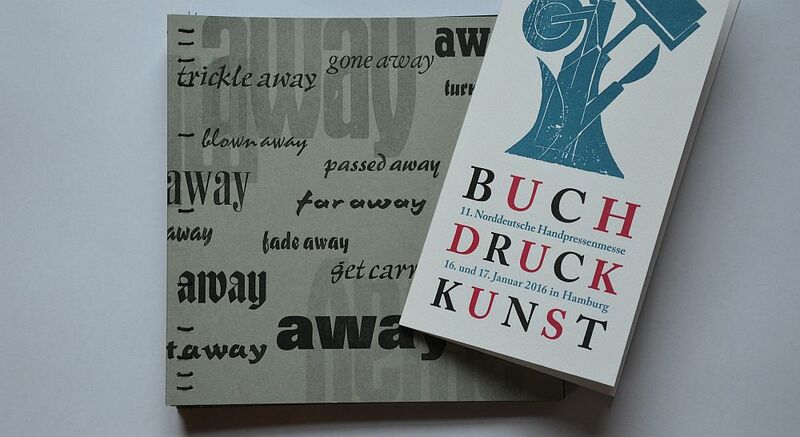 The cover is printed on grey Gmund Bee paper. The pages are fitted with glassine sheets to protect the photographs. The book was presented to the public at the Fine Press Book Fair in Oxford in autumn 2015. As I write this the sun is shining from a spotles sky. We had one more rather frosty night and everything out there is covered in white frost. The world looks a beautiful and quiet place. Normally around noon the rooks will come in numbers and search our meadow for lunch. I doubt they will do so today – with night temperatures as low as minus 7C the sandy soil gets rocksolid. The cranes have gone away on their annual migration. And we may expect those fascinating birds back some time in spring. „52 Weeks“ is my first photobook so far. In a previous post I have outlined how I came to be making this book in the first place. The post came with both a portrait of my fellow artist Marianne Midelburg (who of the top of her head said „Yes!“ when I asked whether she would like the idea of making this books together) and me. The post went online in April 2014, days before I presented the book at Turn The Page artist’s fair in Norwich. Now, this current post will go in more detail as for the photographs in the book and some further aspects of interpretation. For all of you who have not yet read the previous post, these are the basics: two artists, one from Australia and one from Germany, each took one photo per week for one whole year. This resulted in 52 pairs of photos. Also, each photo comes with a short commentary written by the respective artist. 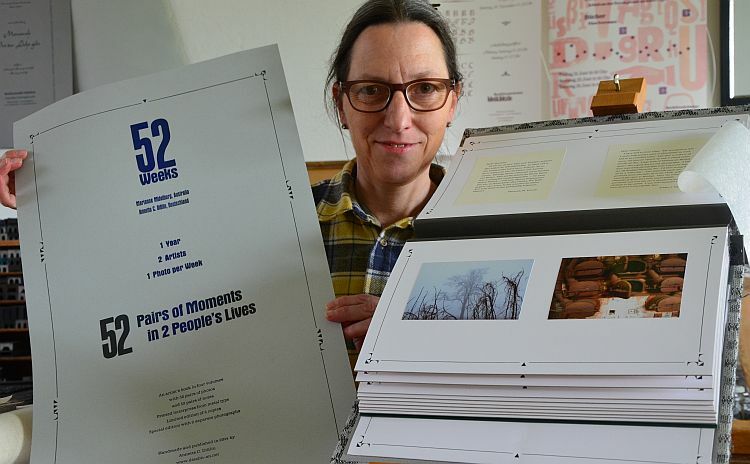 Thus the book presents 52 pairs of moments from the every day life of two artists. All photos have been taken in the vicinity of the places where we two artists live. The artist’s book „52 Weeks“ is about those little every day life things and moments in our surroundings we tend to drop out taking notice of after some time. At some point we just take them for granted, or simply walk past. „52 Weeks“ is a book that asks for our mindfulness, it asks for what makes things familiar and what makes them alien to us. It asks for what makes us feel at home, quite literally but also in a broader sense, and what makes us feel a stranger. Also, this book is about what we treasure. It is about a very special tree growing in some field. It is about that one particular bench on this one particular path through the bush and this one quiet spot in a wood we go to again and again because it makes us feel at home in some sense. It is about this very special scene in autumn when the fog is still asleep in the valleys and the hilltops stick out, underneath a spotless blue sky with a blazing morning sun; a moment that is just awesome. It is about that small creek bubbling with water after it had run dry for years. And it is about the white frost in the coat of grazing sheep and goats on an icy early winter morning. This book is about those places and moments in our vicinity we treasure, whether or not we are aware of doing so. In one sense „52 Weeks“ wants to make us become aware of how different and, at the same time, how alike our own life might be compared to somebody else’s life. And it is not necessarily the milage that makes the difference. Our next door neighbour might live a life totally different to us while the every day life of somebody thousands of miles away might have much in common with our own. The book wants to make us reconsider our preconceptions. Basically, most of my art work is to do with humaneness. As for that „52 Weeks“ does not make an exception. Our attitude towards the situation of others and towards our own situation might change dramatically once we try to put ourselves in the other person’s place. This is the moment when enmity, preconceptions, discrimination and humiliation all of a sudden lose their basis. They just fall to pieces as we realise, we all are human beings after all. We all prefer not to be offended, but approached with kindness and respect, whether counting as local or foreign. We all wish for a safe and peaceful life. And for all and each of us there are those small things and those precious moments in our surroundings we treasure and that make us feel at home. And we all do not want to take the blame for other people’s crimes, just because we happen to have the same skin colour, religion or nationality as the criminals. These might well become aspects in the case that you will not be staying in that particular place where you’ve been born to live there until the day of your death. There are countless reasons why you might leave or be forced to leave the place that was home to you. It need not be war or terrorism or starvation. But it can well be. You might not move far or the trek might take you around half of this planet. In either case you might find yourself being called a stranger, being alienated, refused access to a community. This might or might no be for the colour of your skin, your religion, your language or even accent, the clothing you wear. All this can be the wake up call for preconceptions, humiliation, bullying. This wants to be read as a plea for a policy of open arms&minds rather than one of closed borders – in heads as well as in nations. What makes us feel at home is tightly connected with what feels strange to us. Both are just two sides of one coin. One makes us feel safe and comfortable, the other scares us. Fear towards what we feel is foreign is the least appropriate coach imaginable in a society wishing for peace. Fear tends to generate hatred. And acts of hatred tend to produce new acts of hatred. We need a world of understanding and respect, if we want to drain hatred from its powers and create a world of peace. I strongly believe that there is no overcoming war and terrorism by shooting back. And I am convinced that peace and freedom cannot be gained by air strikes or snipers or assassins. It is a sad coincidence that I write these words just days after the shootings in Paris. It is our mindfulness that can make us stand strong against all hatred. It all starts on our very doorstep. There are many more offers and options to be found in this book. Go and find yours. My books do not want to restrict your thinking, my books want to enhance it. Use your thinking, that’s what you’ve been given it for. Technical notice: In this post not the original image files have been used. All photos included here are shots taken from the books itself. This was done to keep the book feeling alive, even though it meant that the photographs themselves lose some of their brilliance-which they have, I can assure you. 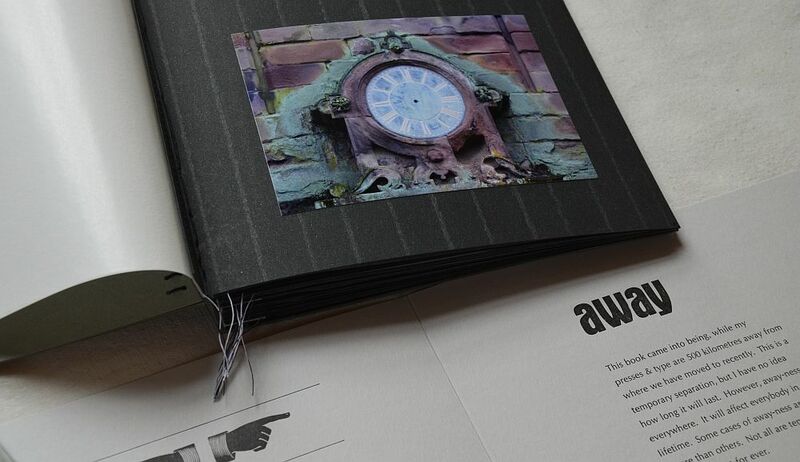 The artist’s book “52 Weeks” has been published in a limited edition of 6 numbered copies, each signed by both artists. Each book consists of 4 volumes. 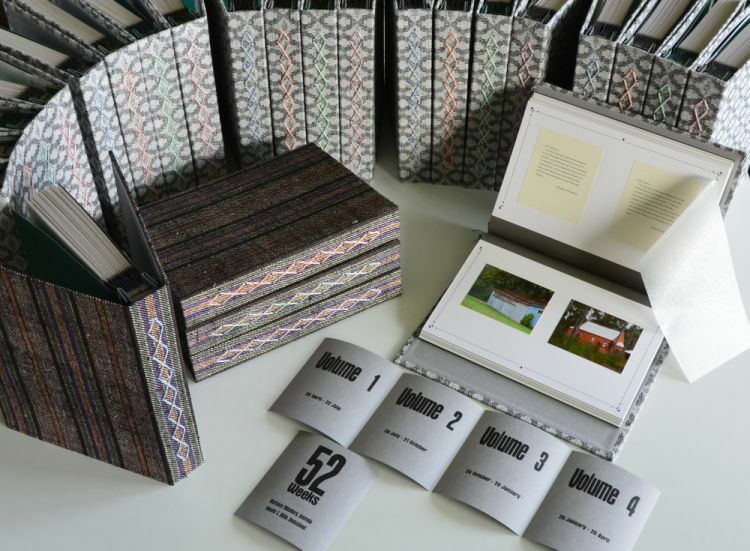 The book is a collaborative work of art by Australian artist Marianne Midelburg and German artist Annette C. Disslin. Copy No 1 is the special edition and comes with two extra photographs, one by either artist, that can be framed. Find more information on my work and studio on my website.